KUALA LUMPUR: The transformation of land public transport in the country will remain a top priority for the benefit of all Malaysians, says Datuk Seri Najib Tun Razak. 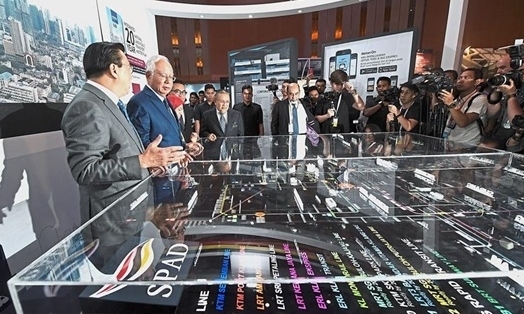 The Prime Minister said the Government has set a new goal under the National Transformation (TN50) plan to be a top 20 country by the year 2050. “Currently, we are planning for an inclusive and comprehensive public transport system. “Public transport is part and parcel of this transformation in line with the demand of an informed and Internet-savvy population,” he said in his address at the Land Public Transportation Symposium 2017 yesterday. “We may be able to export high-quality and high-value Malaysian expertise overseas to help build mega infrastructure projects in other countries"
Also present were Transport Minister Datuk Seri Liow Tiong Lai and Minister in the Prime Minister’s Department Datuk Seri Nancy Shukri. Najib said the Kuala Lumpur-Singapore High Speed Rail, the East Coast Rail Link, Rapid Transit System would be a backbone to the railway system, predicting that the sector would accelerate the creation of some 100,000 technical and high-skilled engineering jobs with opportunities in complex and cutting-edge projects. “We may be able to export high-quality and high-value Malaysian expertise overseas to help build mega infrastructure projects in other countries. “These are added benefits that we stand to gain as we continue to build projects for the people and invest in strengthening our human capital,” he said. The Prime Minister said the Government had also expanded the urban rail network from 279km to 369km and it would further grow to 505km with the completion of LRT3, MRT2 and MRT3 Circle Line. “With the landmark success of the MRT Line 1, land public transport can become a real game-changer in transforming the lifestyle of Malaysians by reducing traffic congestion, paving the way for green mobility and reduction of carbon emissions in Greater Kuala Lumpur,” said Najib. He added the MRT Line 1 from Sungai Buloh to Kajang showed that the Government was committed to realising land public transport projects for the well-being of the people. “From July until August, a weekly ridership of over 800,000 passengers has been reached with over one million passengers over the holiday week of Aug 27 to Sept 3. “With a capacity to carry 400,000 passengers a day, we are confident that these numbers will grow as more people switch to public transport over time,” he said, adding the Land Public Transport Commission (SPAD) estimated that some 40,000 cars were removed from the roads daily due to the MRT. Najib said SPAD and MRT Corp were now carrying out detailed feasibility studies on the MRT Line 3 alignment. The Circle Line covers areas such as Bandar Malaysia, Mont Kiara, Sentul, Mid Valley and Setiawangsa with the Government looking to fast track the construction in phases. “Insya-Allah, with all these measures in place, we are on track towards making our cities more liveable and vibrant,” said Najib. He said another milestone was in the offing with the bilateral agreement between Malaysia and Singapore for the Johor Baru-Woodlands Rapid Transit System (RTS) link project in December. “The 4km RTS system is expected to be completed in 2024, connecting Bukit Chagar, Johor Baru and Woodlands North in Singapore. “The service is expected to carry up to 10,000 passengers per hour in each direction and will significantly reduce congestion at the border crossing,” he said.